Boeing 737 Max Lion Air Crash: For Family Of Victim, 'The Happiness Is Gone' When a 737 Max crashed off the coast of Java last October, all 189 people on board were killed. Dozens of suits have been filed against Boeing, the plane's manufacturer, by relatives of the victims. When a friend texted him the news that a Lion Air plane carrying 189 people had crashed off the coast of Java early on the morning of Oct. 29, a Jakarta man named Fenlix felt an immediate sense of dread. His only brother, a 31-year-old building contractor named Verian Utama, was scheduled to fly the same route that very morning, heading to the Indonesian city of Pangkal Pinang on a short domestic flight. "I didn't know at the time, what is the flight number of my brother's flight? But then I called my parents. I called my father and asked him," recalls Fenlix (his full name). 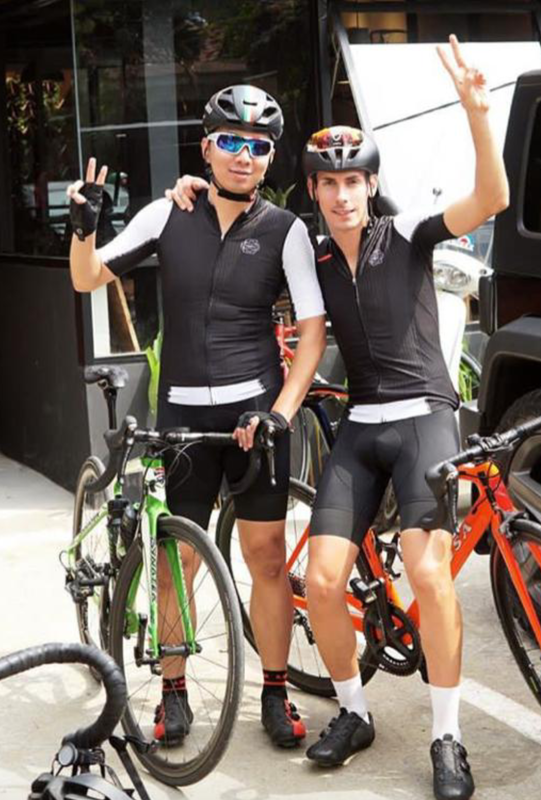 On the day of the Lion Air crash, Verian Utama (left) was traveling on the flight with a former pro rider named Andrea Manfredi (right), a friend who also perished. Over the next few hours, Fenlix would gradually determine that his brother and the other passengers had perished on the flight. And thus began a painful odyssey for their family that would ultimately lead them to file one of dozens of lawsuits against Boeing, the U.S. company that made the plane that crashed, the 737 Max. What happened on board the flight is still being investigated, but what's known is that the plane encountered trouble almost as soon as it took off. "We know from looking at subsequent flight data that basically the aircraft — for lack of a better way of putting it — began porpoising or oscillating, almost undulating in the air," says Chicago attorney Austin Bartlett, who has filed suits on behalf of relatives of the crash victims. With the Max version, Boeing had redesigned the 737 to make it more fuel efficient, moving the engines forward, which changed the plane's center of gravity. To compensate for the shift, the company installed new computer software meant to stabilize the plane. But something went wrong, and the pilots spent their last few minutes frantically struggling to keep the plane's nose from dropping, reportedly consulting a training manual to see what to do. Attorneys for the families say Boeing, which didn't respond to a requests for comment, should have arranged to train pilots in how the software worked. "These pilots had no idea about it. It was like they were fighting a ghost, if you will, because they didn't know what was causing it," says attorney Charles Herrmann. They also point to reports that the very same plane had encountered similarly terrifying problems the day before the crash and was saved only because an off-duty pilot riding in the cockpit knew how to disable the flight-control system. "Some of the passengers on that flight vomited and likened it to a roller-coaster ride," Bartlett says. The crash of a second 737 Max in Ethiopia this month under very similar circumstances has only strengthened the case against Boeing and puts pressure on the company to settle, Herrmann says. But for relatives of the victims such as Fenlix, the second crash has also meant reliving the pain of last Oct. 29. "I just feel that, oh my God, more people will feel like me, feel the loss of their loved one," Fenlix says. The parents of the two brothers had struggled to put them through school, and by the time the crash happened life seemed to be going well. Verian Utama was a contractor who left behind a wife and baby, Fenlix says. He also had a sideline as a distributor of Italian bicycles, which he loved, and on the day of the crash was traveling with a former pro rider named Andrea Manfredi, a friend who also perished. Now, the family is heartbroken, Fenlix says. "The thing is, it's totally changed now. It's totally changed. It looks like the happiness is gone and worry is coming," he says. The family was offered a lump-sum payment of about $91,000 if they agreed to forgo lawsuits against Lion Air, Boeing and their contractors, but refused to do so. As a result, his brothers' widow and child have received virtually no compensation so far. "My sister-in-law and my brother, they [were] supposed to have a dream of their future," Fenlix says. Now, the family is left with worry, he says. "Of course, whatever they do they cannot bring back my brother to life, right?" he says. But they can alleviate some of the worry his family faces, he adds. Fenlix is especially bothered by reports that Boeing may have skimped on training for the pilots. "Of course, everybody wants to have a good business," he says. "But give priority to safety, because life has more value than business or money."